Known as America’s #1 brand of propane, the Blue Rhino brand offers propane tanks at a variety of popular retailers, including Lowe’s and Walgreen’s, to name a few. A unique name brand and one of the most famous, according to the company’s claims, here, you will find state-of-the-art facilities and people with years of expertise. 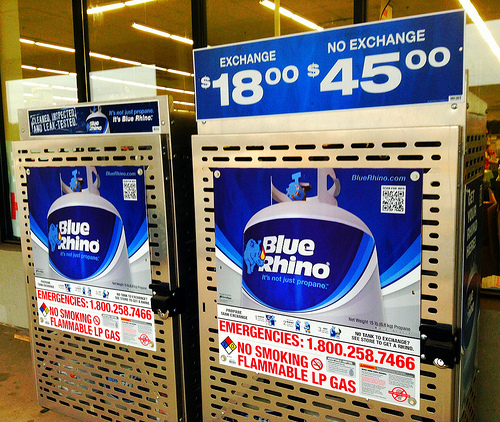 How much does a Blue Rhino propane tank cost? The cost of a Blue Rhino propane tank will depend on a few factors, including the retailer you’re purchasing/exchanging from, the promotion being held, your geographical location, and if you need either a new tank or you plan on exchanging an existing one. As an average, however, be prepared to spend about $20~ for an exchange or $50~ for a new tank without exchanging an existing one. NOTE: Consider this as an estimate only and cannot be guaranteed at the time of purchase/exchange. If you have an existing propane tank and you want to swap it out, then you will bring propane tank to the retailer’s location. Remember, since Blue Rhino is a brand, you will want to make sure the retailer you’re visiting offers the Blue Rhino brand if this is the propane tank brand you want. You can do this by either texting FIND to 75653 or use the website’s official search tool. When you arrive, you will let one of the employees know you want to exchange your tank and will meet them near the display outside of the store after you pay for the tank. Never take your propane tank inside of the store; only meet them at the display outside of the store after you find an employee and pay for your new tank. The company will accept any propane tank as long as it’s in good condition; it doesn’t have to just be the Blue Rhino brand, according to the FAQ. Once at the display, the cage is unlocked, where you then take a new tank of choice and simply replace the space with your existing tank. What’s included with a new Blue Rhino propane tank? Inspection: All new tanks will be inspected by a trained propane expert. Requalified: According to the company, all propane tanks need to be requalified every 12 years from the date of manufacturing and every five years after that. This is all taken care of you for you via the company. Freshly painted: All propane tanks are freshly painted with a new coat of paint before they are offered for purchase again. The correct amount of propane: During the manufacturing process, the company assures they fill the amount of propane the packaging displays. Washed: Aside from being freshly painted, all propane tanks are thoroughly washed as well. Protective cap: Every new Blue Rhino propane tank will get a unique cap, designed to keep the valve clean until you’re ready to hook it up and use it for grilling. Always avoid storing your tank in an enclosed building such as a shed or garage. When not in use, always make sure the valve is turned to the “off” position. Never store a spare tank near or beneath the grill. Tanks should always be stored upright, never in temperatures hotter than 125 degrees Fahrenheit. Never use a tank indoors. Do not attempt to repair a damaged tank or valve; it’s not worth the few dollars worth of savings. Even though the tank does note it’s “20 pounds,” many reviewers we found online claim you will only get 15 pounds worth of propane, but this is often the case due to regulations. No deposit is required for the tank. Once you walk away with the tank, you own it 100%. Search for Blue Rhino coupons/rebates and other promotions as retailers commonly have their propane tanks on sale.